This is the next post in my series on how search & seizure issues impact criminal cases in the Phoenix, Arizona area. My last post discussed whether police may search one’s vehicle after stopping it. A driver’s Fourth Amendment rights are violated far more often than many realize. 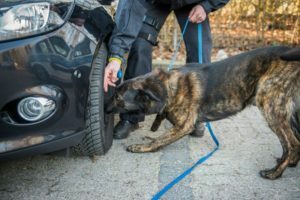 In this post I will discuss whether police may use a drug-sniffing dog to conduct a search after they have stopped one’s car. This is an important topic as the law on this subject has recently changed. The United States Supreme Court changed the law, regarding the use of drug-sniffing dogs, in Rodriguez v. U.S. The United States Supreme Court recently entered a landmark decision in the case of Rodriguez v. U.S. Prior to Rodriguez, law enforcement could utilize a drug-sniffing dog as part of any traffic stop. In other words, if one was stopped for a traffic infraction then law enforcement could make the driver wait for a drug-sniffing dog to arrive on the scene and smell the outside of the vehicle. If the dog detected drugs then the officer would have probable cause to search the vehicle. This rule, however, has changed. Under Rodriguez, law enforcement may still utilize a drug-sniffing dog during a routine traffic stop. They may not, however, make the driver wait for a dog to arrive on the scene. Once the officer stops a car then they may only detain the driver for the time necessary to issue a citation. If it takes longer than that time for an officer to get a drug-sniffing dog on the scene then the use of a dog will be considered unlawful. In practice this means that an officer will only be able to employ the use of a dog if he or she is a K-9 unit who already has the canine in the vehicle. If you have been arrested after a drug-sniffing dog found narcotics in your vehicle then it is possible your rights were violated. Contact a criminal defense lawyer immediately. If you live in the Phoenix area and have been arrested for illegal narcotics then it is important to understand that you have rights. The fact that narcotics were present will not justify the fact that an officer violated your rights. Consulting with counsel, who understands this area of law, may make the difference in the outcome of your case. Call an attorney today. In addition to Phoenix, I also service other Maricopa County cities such as Mesa, Glendale, Scottsdale, Chandler, and Gilbert and I assist Pima County residents in Tucson.